rj45 connectors. 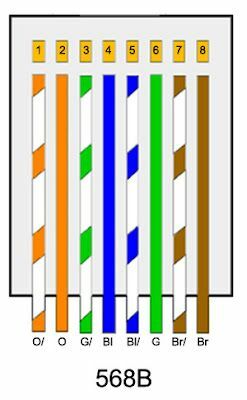 Does the order of wire cores matter? Discussion in 'Hardware' started by mike42, 7 Dec 2018. Cabling up some ethernet leads for the first time and was wondering as long as I cable them the same way at both ends does it matter it I don't follow the conventions? Yes, it does matter. You must keep the pairs together. You may notice the green pair is split either side of the blue pair which is backwards. You can't just ignore that and go, say, 1white/orange, 2orange, 3white/green, 4green, etc, because you've just separated the green and blue pairs by doing that. They are twisted in pairs to reject any interference from outside the cable, and reduce them outputting interference themselves. Interference is even picked up between pairs within a single cable. Really helpful couple of posts there rzgaz. Many thanks indeed ! Technically as long as the wires are crimped the same either end then it doesn't matter. But that would be poor practice. Doing my CCNA one of our first task was to make like 20 network cables. Was a crappy job but means I remeber the above off by heart! The best way to go for simple network conenctions, think the blue/green changes if you want crossover! Technically as long as the wires are crimped the same either end then it doesn't matter. You must keep the pairs together. Try again with a 90metre cable running at a Gig. Or in a bundle of a 1000 cables where all the other cables have data going down them. Or near anything with a lot of EMI (large electric motors, loudspeakers, etc). Or near any relays or contactors which are switching heavy loads on and off. How many ethernet frames had to be re-sent in your test you just did out of interest? Run the vacuum cleaner near it and look at the figures again. In an isolated bench test it may appear to work, yes, I agree. Each pair is also twisted to a different 'frequency'. Yep, 'normal' 100Meg only uses the green and orange pairs. Telephones use the blue pair. Gigabit ethernet uses all four pairs, as does POE. Wasn't putting a paramiter in place. Was just stating a bit of how to. As I keep saying, I'd always do it the way I was taught! It does seem odd when you first look at order, but it allows backwards compatibility, so centre two are a pair, then next pair either side of centre two so still central, then when extra 2 pairs added they are to left and right or original 2 pairs. As said every pair is twisted to ensure the impedance is correct, the technology is called transmission lines, even main power in Africa where the lines run 1000's of Km you can have problems, but in the main lower frequency signals do not have a problem, as you reach HF you see 300Ω ribbon cable, the into coax where you have 95Ω, 75Ω, and 50Ω with computer were 95Ω and TV 75Ω and CB and Amateur radio 50Ω. Cross over networks can be built to change the impedance, in radio called balums. The power is reflected back if the impedance is wrong, CB uses called is swr it is the ratio of power out to reflected power called "Voltage standing wave ratio" and the longer the cable the greater the losses so a patch lead if 1 goes to 1 etc then it will work OK, but with a long run it will fail. What does the 3 volt laptop battery do? Making up LAN RJ45 cables. Cleaned PC now it does not work! DOES ANYONE KNOW A SAFE DRIVER DOWNLOAD SITE FOR WINDOWS 7.
pc does nothing when i switch on?